Visitors are often surprised to learn that the island of Kauai has a mayor for the entire island and that cities and towns on Kaua`i do not have individual mayors. North Shore: Explore the dramatic natural beauty of the North Shore from Hanaeli to the enchanting Napali Coast from lush taro fields, pristine beaches and extradoniary sea cliffs. It is home to Kauai's premier golf courses. East Coast: Enjoy the Coconut Coast with groves of coconut palms and visit Kapaa Town. The town of Kapaa on Kauai has been named one of "Americas Prettiest Towns" by Forbes Magazine. It is the only town in Hawaii to make their list. Take a bike ride on the bike path, shopping for fine art, jewelry or arrange for water skiing or kayak rentals. South Shore: Some of the top attractions are the beautiful beaches and Spouting Horn, a blow hole releasing a spout of water up to 20 feet into the air. Explore charming boutiques and dine on Pacific Rim cuisine. Be sure to stop at Old Koloa Town rooted in its plantation past. Koloa opened its first sugar mill in 1835 and set the precedent for commercial sugar production across the Hawaiian islands. West Side: The Grand Canyon of the Pacific is breathtaking Waimea Canyon. Hiking Trails and scenic overlooks offer sweeping views of rugged terrain and valleys dipping more than 3,600 feet. There is nothing else in Hawaii like it. Two small towns of Waimea and Hanapepe are worth exploring. In 1778 Captain Cook first landed in the Hawaiian Islands here at Waimea Bay. One of the communities on Kaua`i�s north shore, is a designated Hawaiian Homelands, a residential area available to Native Hawaiian people. The old part of Anahola is located along the bay, and the newer commercial part is located along the highway. On the south shore, close to Po`ipu and Glass Beach, a popular spot to find sea glass. In the past, sugarcane fields dotted this area, but today, coffee is produced here. Ele`ele is home to the largest coffee producer in the state of Hawaii. Backed by green mountains and waterfalls, Ha`ena is at the beginning of the 11-mile (18 km) hike to Kaua`i`s remote and scenic Na Pali Coast. Near Ha`ena is Tunnels Beach, one of the best snorkeling and diving beaches in Hawaii. A visit to the Koloa History Center and a tour of the nearby Koloa Heritage Trail will give you an insight into the Kaua`i`s sugar industry. You can also see the remains of an old sugar mill here. Hanalei, is a charming small town on Kaua`i`s north shore. There are several centers in Hanalei offer shopping, dining, and entertainment venues. It is home to taro fields, art galleries, and great restaurants. Hanapepe bills itself as "Kaua`i�s Biggest Little Town" (look for the welcome sign with this slogan on it as you enter the town). It is mainly known for its art scene with the greatest concentration of artists on the island. Look for Friday nights when the local artists come to display their art and play their music for a relaxing evening. Kapa`a has a population of about 9500, Kapa`a is the largest town on Kaua`i. It offers a variety of shopping opportunities, from small boutique stores to a large shopping center. Plenty of restaurants to experience. Kilauea has a major attraction which is the Kilauea Lighthouse, built in 1913 by the US government on a narrow peninsula that forms the northernmost point of Kaua`i. This area is popular during whale-watching months as whales are easily seen in the shallow and warm channel. Kilauea has a the lighthouse and a wildlife preserve on the coast. 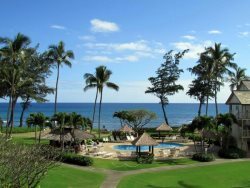 Lihue is Kaua`i`s capital and mainly a residential community. Places of interest are the Nawiliwili Harbor (where cruise ships dock), Menehune Fishpond, Kalapaki Beach, and the Kaua`i Museum. Po`ipu is the most popular tourist area on Kaua`i, located on the island`s south shore. It is a resort community featuring numerous fine accommodation options facing the ocean. Spouting Horn, a definite must-see spot, is in Po`ipu. Not far from Po`ipu is Spouting Horn and the artist market. Princeville is a master-planned luxury resort community overlooking Hanalei Bay on Kaua`i`s north shore. Private tour companies offer horseback tours, and the popular zip line tours, all starting from the Princeville area. Wailua has main attractions in Wailua are the Wailua River and Fern Grotto (accessible by boat or kayak). Also, 2 popular waterfalls in Wailua River State Park � Wailua Falls and `Opaeka`a Falls � are found in Wailua. Waimea is on the west side, which is not as lush as the rest of Kaua`i, Waimea has attractions that are worth visiting, including old buildings, churches, and sugar mill ruins, as well as the Captain Cook landing site. You will also find Waimea Canyon, the Grand Canyon of the Island.